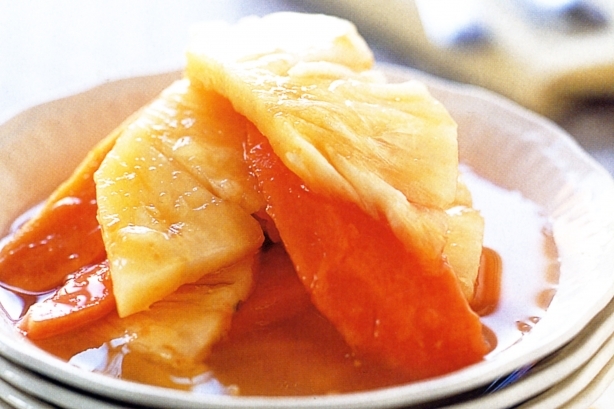 Pawpaw and pineapple with lime syrup…yum!! 1. Cut limes in half and juice. Strain juice into a cup Ã¢?? you should have 1/3 cup of juice. 2. Combine lime juice and honey in a small saucepan over low heat. Cook, stirring, for 5 minutes, or until honey has dissolved. Remove from heat. Set aside to cool slightly. 3. Cut pawpaw in half length-ways. Peel with a sharp knife. Using a large metal spoon, scoop out seeds. Thinly slice pawpaw flesh. 4. Peel pineapple and remove the eyes. Cut pineapple in half lengthways, then slice thinly crossways. 5. Arrange fruit in serving bowls. Drizzle with lime syrup.